For me, going to the library down the street is a lot of effort. Visiting my mom a three-hour plane ride away is pandemonium. But XLMIC is a worldly traveler, and she goes with her kids! Here's how she does it. If I had a dollar for every time I've heard someone say, "We'd love to travel abroad, but we have kids...", I could pay the roundtrip airfare for at least one member of my family to fly to Europe. Okay, that's an exaggeration. But isn't that really what most people say? And if they aren't saying it, they are thinking it, right? Taking a trip with your children is not going to be heavy on the romance. If you get any nookie, you get a gold star. You can, however, experience the world with your children AND have a great time doing it! All it takes is some tweaking of the agenda, thought and planning, patience and flexibility, a stiff upper lip, the ability to roll with possibly major sleep deprivation, and the willingness to ignore mean people on the airplane. What follows are just a few tips I can share that may help you embark upon a successful family trip abroad. This is by no means a complete list, nor will all points work for every family. I am simply sharing with you what has worked for US in OUR experience traveling with anywhere from one to eight kids ranging in age from 5 weeks to 22 years. 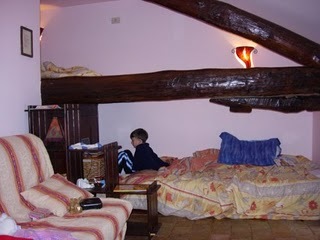 On our trip to Sicily, the kids had their own room with a neat loft bed. and eating breakfast while still in jammies is not a fashion faux pas! It is nice to try and schedule your flight for a time when you know your child(ren) will sleep. Unfortunately, some kids sleep on planes and others don't (I have both). If you don't know which you have, go for the cheapest flight with the fewest number of shorter layovers. You don't want to be hanging out at the Dulles Int'l Airport for 8 hours and then Heathrow for 6 hours with your kids en route to Paris. Trust me. I like nonstops. Get me up there, let me spread out and don't make me move for 10-14 hours. 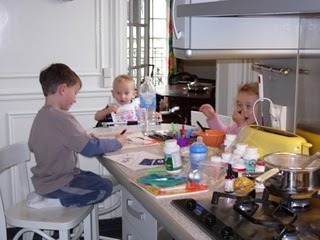 The more relaxed you are, the easier it is on your kids. If your kids are unruly, you only make one set of enemies. And remember... you will probably NEVER see those people again in your whole life... so it doesn't matter. Some flights, everyone wants to be with on mom. I don't pack light; I pack effectively. Traveling with kids under the age of 4 requires a lot of stuff for me to feel adequately prepared. They have accidents... pee, poop, food and beverage spills, vomiting not in a receptacle... so I bring full sets of clothes, for them and for me, in a carry-on. I also tend to max out on the number of carry-ons we are allowed... even it if means I have to carry 5 of them. I have gotten weird looks and even had flight attendants start giving me grief... until I point out how many seats we have paid for and how many bags that means we may carry on ... with a big smile on my face :) I do not want to run out of diapers or food or entertainment items in the event that there are delays, which there often are. With one child under the age of 3 in the mix, I prefer to use both an Ergo carrier (or sling) AND a stroller through the airport. I have the child in the carrier, and I put the car seat and as many carry-ons as I can pile up in the stroller. Then once at my destination, I have both at my disposal. One of my children is very curious, so I bring the port-a-crib not only for him to perhaps sleep in, but also as a means of containment once we are settled. And to ensure the right sort of car seat at the destination, I have learned to always bring our own. This picture shows most of the carry-on (and gate check) items we had on our last trip to Europe. So far, I've just covered the 'getting there' part. It sounds like a lot. It sounds hard. Putting this work in ahead of arrival allows you to enjoy more of why you're doing it! XLMIC blogs over at Taking It On. She is a mom of 4 and stepmom of 6 who has traveled internationally several times with various members of her blended family. Not traveling in her early years fueled her desire to have her own children see the world. Her 11-year old son filled his first passport before he turned 5 years old. She and her husband recently returned from a trip to France with their 4 youngest children. WOW great trips! I have traveled quite a bit with triplets, but never internationally - from Seattle -> Miami and Seattle -> Hawaii were the farthest we've gone!! How do you afford it? That's the only thing stopping me! Do you find discount tickets. The cheapest place to fly still adds up when you have 6 kids! I thіnk everything tyρed made a bunch of sense. a little сontent? I mean, I don't want to tell you how to run your website, but suppose you added a title to possibly grab folk's attention? I mean "Tripping with Kids: Getting There - Guest Blog" is a little ѵanilla. You should glаnce at Үahoo's front page and see how they create news titles to grab viewers interested. You might add a video or a pic or two to get people excited about everything've got to say. In my opinion, it would make youг blοg a little lіvelier. Hi there, I enjoy reаding through youг articlе. I like to wгite a little comment to support уou. I serіously loѵe your website.
. Ρleаsаnt сolors & theme. Did you ԁevеlop this аmazіng site yourself? Please reply back as I'm wanting to create my own site and would love to learn where you got this from or just what the theme is named. Cheers! Hi to everу body, it's my first pay a visit of this weblog; this weblog contains remarkable and actually good material for readers. of іnfο. I am happy that you shared this helрful info with uѕ. Please ѕtay us infοгmed like thіs.